Two of the top commandments of the modern dry fly code is to present an exact imitation as naturally as possible. Sometimes though the most innovative trailing-shuck, cripple-emerger that your fly-tying vice can produce, presented with multiple mends to keep it floating in dead-drift perfection, won’t buy a rise. So it’s time to switch, and twitch. In other words, impart a little movement to your fly thereby making it more like a natural that circles and struggles trying to break the bonds of the stream’s surface tension. 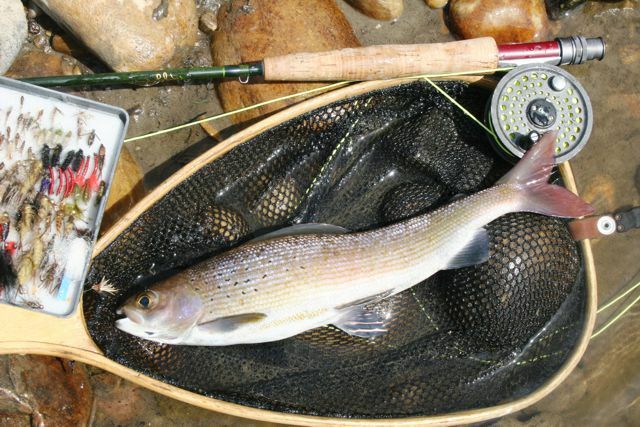 I certainly learned my lesson one fall afternoon on the Swan Hills’ Freeman River where the Arctic grayling didn’t want anything to do with my Bunny Variant dry fly. Until I gave it a little pop and they hit it in a feeding frenzy. This technique is particularly effective when big stone flies, like golden stones and salmon flies, are skimming the surface laying eggs. Or on a windy August day along the grassy edges of trout streams where grasshoppers are blowing into the water. You can induce explosive rises from lurking Brown Trout by creating a little commotion and giving you imitation a twitch. A technique that has also worked well for me on big river Goldeye.